Height: 18.0 c.m. Max Dia - 13.0 c.m. Add a candle to this eight-pointed star to fill the night with celestial light. 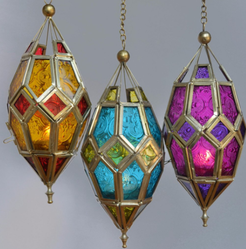 Artistic hanging lantern features ornate panels of clearest glass set into a wrought brass frame. Stainless steel shiny polished Glass Lighting lantern home decor for homeware or lighting decorative. 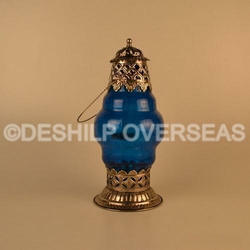 This beautiful Glass Bell Jar Lanterns, used as a traditional lighting device decades ago is suspended by a brass collar and adjustable chains. Originally used for candles, it can now be electrified with a 3 light candelabra. It is available in different etching designs, colors & sizes. Iron & Glass Lantern Colored. Glass mosaic laltan with stand and mirror.